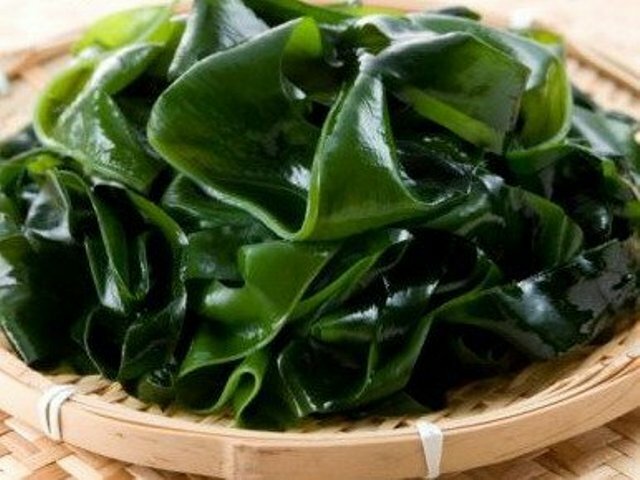 Fresh sea cabbage or kelp was used by the ancient peoples living on the shores of the Pacific and Arctic oceans, for human consumption, prevention and treatment of various diseases. Fresh seaweed is rich in iodine, amino acids and trace minerals more than any other plant. This product is created by nature itself and almost ready to eat. Collect fresh seaweed plan during low tide; remove it from the soil directly to the root. When the desired amount of algae is collected, remove the roots, trim off any yellow and damaged leaves. Cabbage should be without flaws. Home rinse the leaves, it is convenient to do it directly in the tub. Cut into equal pieces the size of a palm. Take roomy enough pan, lay in her seaweed about half. Cover with cold water, put on fire and start to cook until boiling. Once the cabbage is boiling, wait 5 minutes, drain and again pour the cabbage with cold water. Again, wait for the boil and after 5 minutes turn off the heat. Seaweed after cooking rinse with cold water. Cool. Cut the cabbage in its sole discretion - looks nice cabbage, sliced into thin noodles. Then use cabbage for cooking: salads, soups, side dishes. To seaweed preserved longer, do it for a marinade. To do this, take 2-3 cups of hot water, add salt, sugar, cloves and Bay leaves – all to taste. Boil this mixture for 15 minutes, drain excess liquid, cool it, add vinegar to your liking. The cabbage pour in marinade and soak it for 6-8 hours. When cooking the kitchen is usually filled with a strong smell of iodine, but it's not terrible. It is important to protecet this moment. And completely get rid of the smell will help preservation or pickling. There is another way of cooking with fresh seaweed. The cabbage layers are hung or spread out in the sun and thus dry, but it is a very long process that not always ends with the desired result. The main thing in this process so that during the week the weather was Sunny. With seaweed combined with any products, so do not be afraid to experiment. 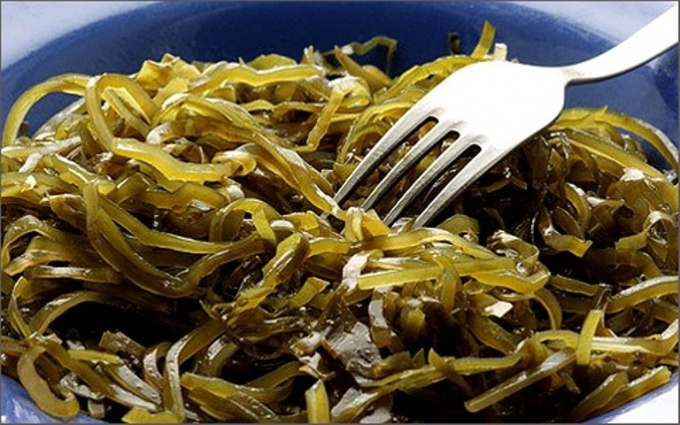 Seaweed – household popular name algae kelp, the best natural source of iodine, which is so necessary to modern man. The use of seaweed regulates blood clotting, reduces the level of cholesterol in the blood, the risk of developing cardiovascular diseases, improves the work gastrointestinal tract, strengthens the immune system. The sea cabbage can be kept from freezing and direct cooking. In this case it is boiled in three waters: bring to the boil and cook in boiling water for 10-15 minutes. Cooled boiled sea cabbage finely chop and sauté in butter. Put the cabbage in a baking dish, fill it with beaten eggs, season with salt. Put the dish in the oven and bake until tender: about 20 minutes. Melt the remaining butter and pour her a ready-made casserole. Arrange cabbage casserole with lemon wedges. Cook the sea Kale and rinse it with cold water. Scroll in a meat grinder together fish fillet, sea cabbage and onions. In the received forcemeat add salt and pepper. In a deep bowl pour flour, break there, 2 eggs, vegetable oil and salt water. Gently stir the ingredients with your hands. When crust is cool, put it on the table, floured and knead. The dough should be homogeneous. Roll out the dough into a cake thickness of 2 cm. Cut out a large cake round blanks for dumplings. Stuff the dough with minced seaweed, roll up the dumplings. Simmer dumplings in lightly salted water for about 20 minutes. Ready dumplings with seaweed drizzle with melted butter. This dish is perfect cream. Seaweed, or kelp, is a real storehouse of nutrients: iodine, organic acids, mineral trace elements, vitamins A, b and C. the inclusion in the diet of dishes with seaweed improves the immune system, normalizes metabolism, regulates the level of cholesterol. In the shops of sea cabbage sold in canned, dried and frozen forms. Before use it should be boiled. - tablespoon of 3% vinegar. Sort through dried sea cabbage, put in a strainer and rinse with warm boiled water. Put into another container and fill with fresh water at the rate of 1:8 (one part kelp, eight parts water). Leave the sea cabbage to soak for ten to twelve hours. Thoroughly rinse kelp in running water, place in a pot, pour hot water in the same proportion 1:8 and put on medium heat. After boiling, cook the sea Kale until cooked for thirty to forty minutes. Then drain the broth. For double boiling, pour rinsed after soaking the kelp with water 1:4 (one part seaweed, four parts water), boil after boiling for thirty minutes. Fold the kelp in a colander, and drain the broth. Pour sea cabbage with boiled water and boil for another half hour. With a slotted spoon to fish the kelp, refrigerate and use for cooking various dishes: borscht, pickle, soups, salads, stews, meatballs and casseroles. Frozen sea cabbage before cooking defrost. To do this, dip it for thirty minutes in cool water (15-20 degrees). Then very carefully rinse with plenty of water. Pour the kelp is cold water from calculation 1:2, place on high heat and bring to a boil. Boil fifteen or twenty minutes and pour the broth. Repeat this procedure two more times. The triple heat treatment of sea cabbage considerably improves its taste. Tinned sea cabbage is ready to eat. But it is also recommended to boil for five minutes. Marinated seaweed. Boil water, add sugar, salt, cloves, Bay leaf and boil for ten to fifteen minutes. Cool the marinade and pour the vinegar. Shred boiled sea cabbage noodles, pour the cold marinade and put in a cool place for eight hours-ten to marinate. 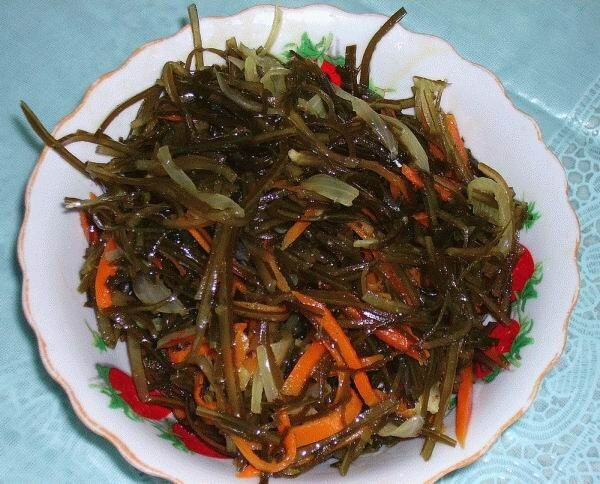 Prepared according to this recipe kelp can be served as a side dish to vegetable and fish dishes, add to salads. Boiled sea Kale can be stored in refrigerator several days and used as needed for cooking various dishes. While cooking soup with sea cabbage, add boiled kelp at the same time passerovannym onions, and canned - along with the seasonings.